Sonija Kwok Sin Nei, Myolie Wu Hung Yi, Alex Lam Tak Shun, Mimi Kung Chi Yan and Alvina Kong Yan Yin two nights ago attended the Anita Mui Yim Fong memorial film DEAREST ANITA...premiere. With the 15th anniversary of Sister Mui's passing, the Hong Kong Women Development Association presented an "Outstanding Woman" award to her. 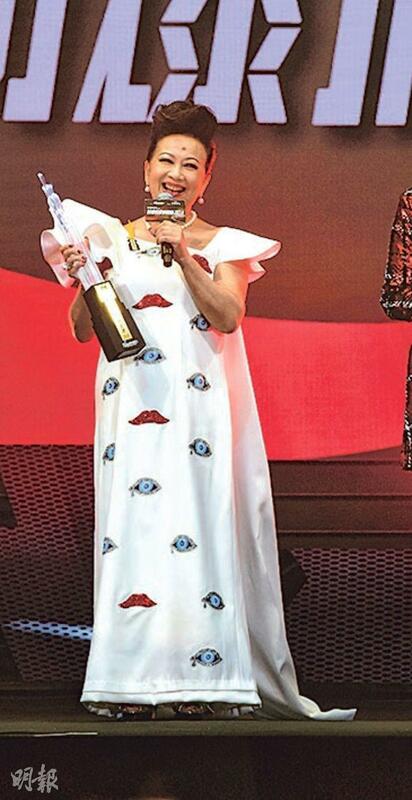 Mother Mui accepted on her behalf. Playing one of Sister Mui's fans in the film, Kwok Sin Nei said that originally she wanted to bring her husband to the show. Unfortunately she informed the event too late and no more ticket was available. She could only buy tickets later. Kwok Sin Nei did not have a chance to see Sister Mui in person, but she was her idol. When she heard Sister Mui's songs, all the memories came back. 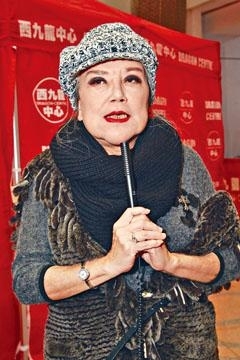 Kwok Sin Nei's character needed to cry with all her might, and she performed wholeheartedly. She said that normally when she cried to her husband it would be ineffective. She said, "My husband is a tough guy but has no tenderness. My crying is useless. Once our daughter and I pretend to cry about not having money for dinner, he didn't fall for it. Of course when I am really unhappy he would comfort me." Lam Tak Shun in the film played Kung Chi Yan's son. With help from Sister Mui's foundation he was able to go overseas and chase his music dream. The character was based on a true story. "When the real life version of the character was little he lost his parents. Mui Yim Fong's foundation sent him overseas to study music. Now he is a very famous musician. He is the same age as me, and our background is somewhat similar. All of which are helpful to my performance." Alex's onscreen father was Joey Tang Kin Ming. When they had time they often played music together, so they was able to get into character even easier. Alex said that since he grew up overseas he never had the chance to meet Sister Mui. However before the shoot he did his research and learned from his father George Lam Chi Cheung that Sister Mui was very friendly and really took care of her friends. Having worked on director Ringo Lam Lan Tung's final film EIGHT AND A HALF (BAK BO BOON), Kung Chi Yan said that although it was her first collaboration with Director Lam she already really admired him. "He has a very stubborn nostalgia for Hong Kong, very thorough with his human nature depictions. When we actors met his demands, he would look very pleased. Thus everyone had a very pleasant time working together. his son in the film played my son." As for when the film will be released, Kung Chi Yan said that she has not received any update yet. 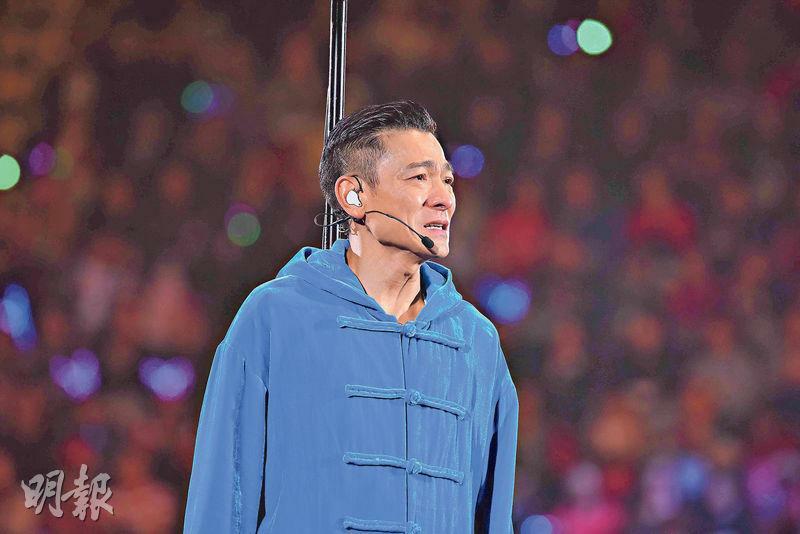 The 57 year old Andy Lau Tak Wa's 20 show MY LOVE ANDY LAU WORLD TOUR Hong Kong concerts have run into obstacle after obstacle. Due to a throat infection he lost hs voice and had to cancel December 28 to 30 shows. Last night the organizer further announced that the remaining concerts from the 31st to January 3th 2019 will also be cancelled; Wa Jai was diagnosed withe flu and needed rest. The organizer said that it would announce details later and apologized to those who have purchased tickets. Many fans on the official site posted that they would understand and support Wa Jai, wish him an early recovery and hope that make up concerts will take place later for him to sing for everyone again. Lau Tak Wa's concert series this time have run into obstacle after obstacle. Originally it was to take place at the end of last year. Because early last year he was injured after felling off a horse and needed to recover, it was postponed until the end of this year. In early September buyers were attacked while in line at the box office, Wa Jai immediately announced that in person ticket sales were cancelled for online sales. Then last Friday (the 28th), he lost his voice due to a throat infection. Around 9PM he tearfully expressed that the doctor recommended against him continuing the show. Despite his reluctance he did not want everyone to listen his voice like that all night. In addition he truly could not continue, so he decided to end the show after finishing IF ONE DAY. He cried brokenheartedly as he sang, bowed in apology to the audience. The audience understood, applauded and cheered him on for encouragement. The next day (the 29th) the organizer issued special notice to cancel the 29th and 30th shows and expressed hope that Wa Jai would be able to continue to perform after more rest. As fans looked forward to Wa Jai's recovery to be able to countdown to and welcome 2019 with everyone tonight (the 31st), in the end the show as well as shows on January 1st to 3rd have also been cancelled. Last night the official concert site issued a special notice to cancel all shows between December 28th 2018 and January 3rd 2019. 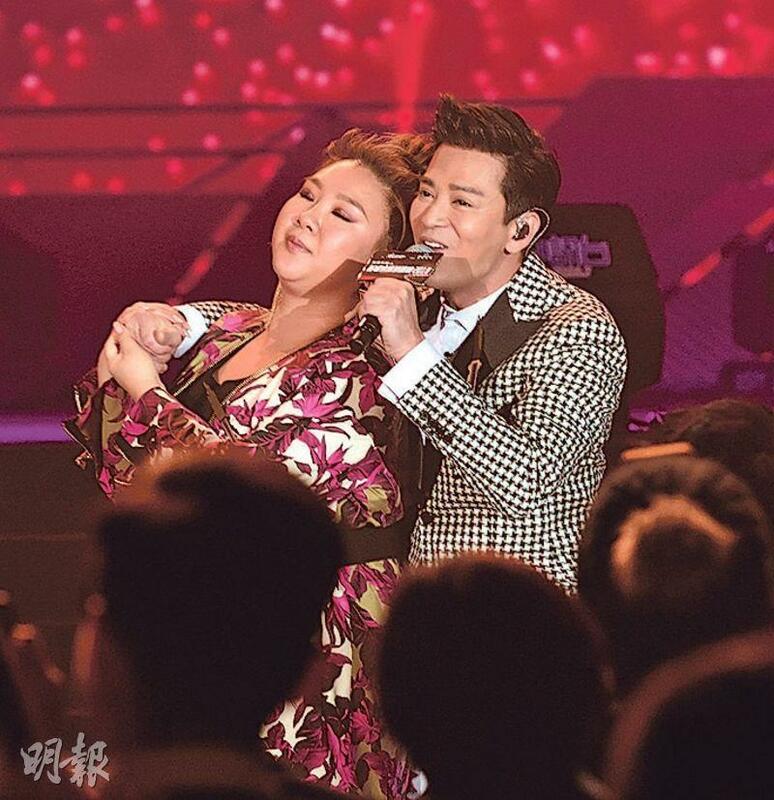 "Earlier Mr. Lau Tak Wa due to a throat infection, at the recommendation of rest from the doctor, was forced to announce the cancellation of 3 shows. Today at the hospital the doctor confirmed that he had the flu and required rest. The organizer now decides to announce the cancellation of the remaining 4 shows (December 31s 2018 to January 3rd 2019). We apologize to all those who support and love Mr. Lau Tak Wa and have already further tickets. For those with valid tickets for concerts between December 28 2018 to January 3rd 2019, please hold on to the tickets. The organizers will soon announce further details. Please forgive us for any inconvenience this may have caused!" Fans left messages to cheer on Wa Jai, told him to properly rest and would support him forever. The most important was health and after recovery he would return to the stage again. 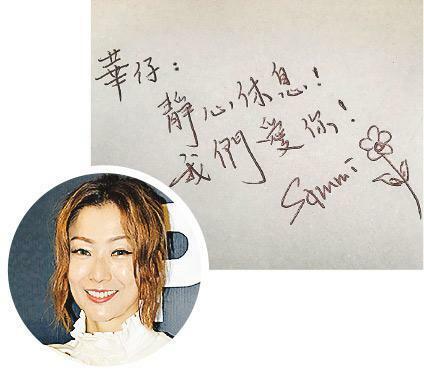 Having lost her voice at her concert, Sammi Cheng Sau man last night personally penned a letter to support Wa Jai online. "Wa Jai: Rest peacefully! We love you! Sammi. Everyone only want you to be healthy and recover soon. We know you take being unable to finish the remaining shows harder than anyone but you can't control illness. Everyone would understand." Susan Shaw Yam Yam, Suet Lei and Lam Chiu Wing yesterday attended Bread-TV Vibration Awards 2018. Bread TV president Lam Chiu Wing led artists in a moment of silence for director Ringo Lam Lan Tung, who passed away two nights ago, in praising of him enormous contributions to Hong Kong film and the new impact he brought to film. Shaw Yam Yam said that due to how suddenly it happened, she found it hard to get over and accept. Two nights ago she cried all night and her eyes were all red. She and many of her friends would all miss Lam Lan Tung. Shaw Yam Yam said that she and Lam Lan Tung were both singing students of Chun Yin, thus they have known each other for decades. She really admired how he kept his feet on the ground, his effort and focus on what he did. "I thought he would at least live until 80. In my impression Ah Tung was very strong, he moved more powerfully than the stunt team. He also knew how to teach actors acting, as a person he was humorous and well mannered. He was also a good friend, a good father. I know that before he passed, his wife and son tried their best to wake him. I never expect this would happen before the New York, I believe it is a tremendous tragedy to his family. However thinking positively, he passed without pain and suffering, I hope his family would bravely live on for him." Yesterday was the 15th anniversary of the late diva Anita Mui Yim Fong's passing. Friends and fans have not stopped missing her. Anita Yuen Wing Yi, Andy Hui Chi On, Remus Choy Yat Kit posted Sister Mui's photos and messages on social media. A group of fans went to Shang Sin Chun Tong to pay their respect to their idol with fresh flowers and many of Sister Mui's favorite food. 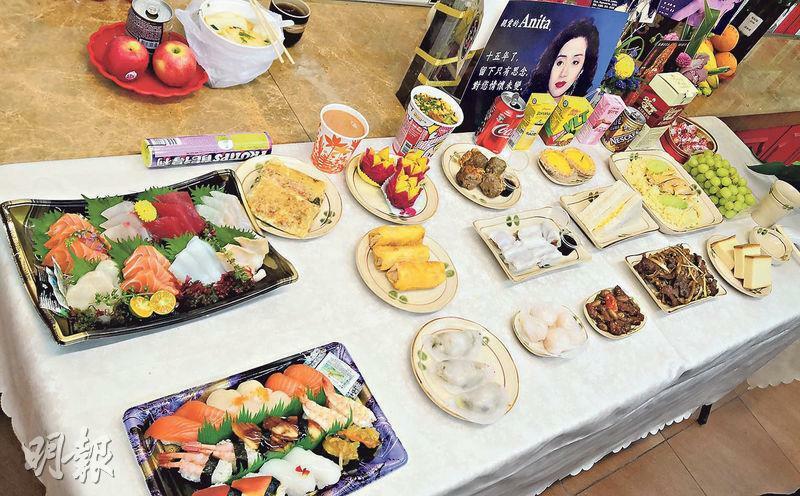 A dozen or so Mui fans yesterday arrived at Shang Sin Chun Tong with fresh flowers, snacks, fruits, sushi, sandwiches, custard tart, instant noodle cups, Hainan chicken and rice and other Sister Mui's favorite food. They also wrote messages to Sister Mui. Some quoted Sister Mui's hit YEARS STREAM LIKE WATER. A fan expressed that everyone came on their own. Every year on October 10th (Sister Mui's birthday) and passing date they would come to pay their respect. Sister Mui's fan club would also notify everyone about any memorial events. Yuen Wing Yi posted online with a photo, "How are you? Today is very sad." Choy Yat Kit also posted a photo of Grasshoppers with Sister Mui. "15 years in the brink of an eye, but we never stop missing you!" Hui Ch On shared an old photo with Sister Mui and friends. "Most recently I read an article that perfectly expressed what I want to say! There is no past or people you can't let go, only past and memories that you are unwilling to let go. What life gives us is either difficulties or growth. We learn to lift the heavy like it is light as we completely let go of the past that we once have no way of letting go of. I wish you bright, direct, expression from the heart, with gains, losses and determination, to be able to cry, to laugh and to have as much joy as possible." Ringo Lam dedicated his life to film. He intended for his son to carry on in the industry but was unable to fulfill his wish. 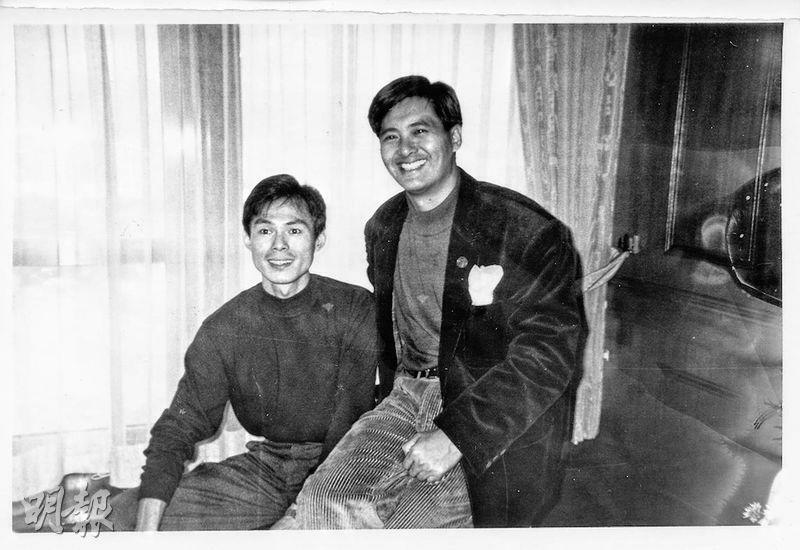 Ringo Lam and Chow Yun Fat were TVB training class classmates. Chow starred in his films like CITY ON FIRE, PRISON ON FIRE, FULL CONTACT and WILD SEARCH. Famous director Ringo Lam Lan Tung yesterday was found dead at his home. The "ON FIRE" trilogy director won the Hong Kong Film Award Best Director with CITY ON FIRE (LUNG FU FUNG WON). The news of his sudden passing shocked show business. Roy Cheung Yiu Yeung who saw Director Lam as his mentor broke down after hearing the news. Friend Eddie Cheung Siu Fai also was unable to believe that it was real. According to the police, a 63 year old man with the last name Lam was found dead at a home on Ma On Shan's Sai Sha Road. The police received a call from Lam's wife, citing that Lam Lan Tung collapsed in bed. When medical personnel arrived his death was confirmed. After initial investigation nothing suspicious was found and the cause of death would have to wait until the autopsy report. The hearse took away the body last night around 7PM. His wife and son also saw the hearse off. Reportedly Lam Lan Tung has always had stomach illness. Recently he caught the flu but did not see a doctor, as he was treated it with medication. Supposedly after he got up yesterday morning, he returned to bed after breakfast. Around 4PM his wife realized that he was still in bed. When she went to the bed to wake him, she realized that he was unconscious and contacted the police. His neighbor said that he greeted him days ago and the news was very surprising. Cheung Yiu Yeung broke down when interviewed. "What! No way! I hope this isn't true. (When was the last time you saw him?) Two years ago at (Johnnie) To Kei Fung's dinner. He made him a star singlehandedly, which I would always remember in this lifetime. I always want to find a chance to thank him, but I was never able to." Cheung Yiu Yeung worked with Lam Lan Tung on films PRISON ON FIRE, CITY ON FIRE and SCHOOL ON FIRE, successfully making a name for him. Cheung Siu Fai was speechless when he heard the news. "I really couldn't accept it. It's too sudden. He can be said as my training class elder." 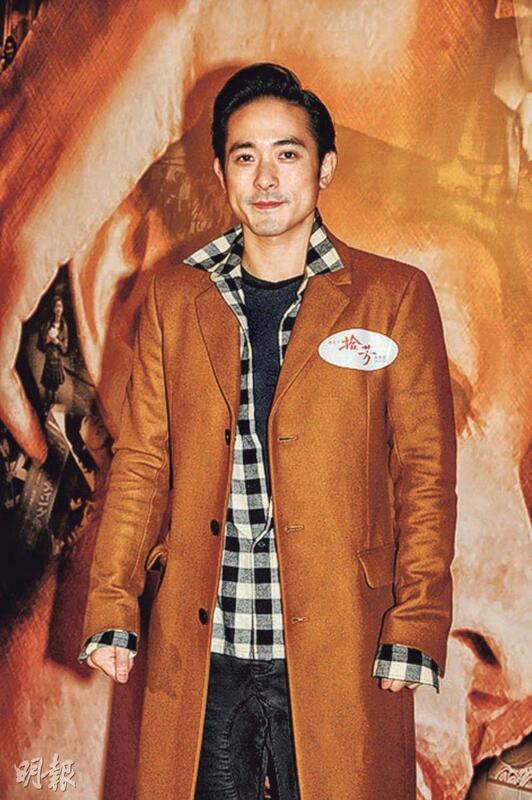 Earlier he worked together on the film SKY ON FIRE (CHUNG TIN FOR). Originally they wanted to work together again but their schedules conflicted. He also said that originally they tried to meet for dinner in March but again their schedules conflicted. "I regret very much that I wasn't able to have that dinner with him. He truly was a very nice guy, he was so healthy. I am really going to miss him!" 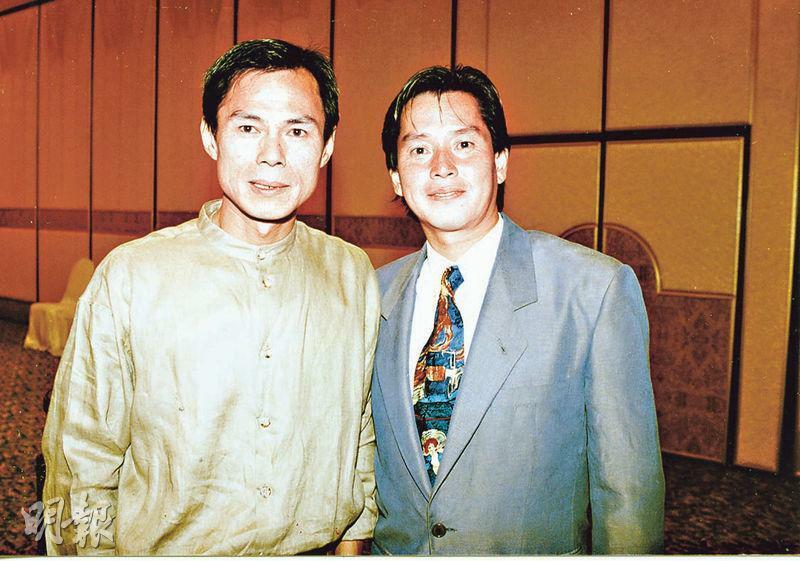 Lam Lan Tung's TVB training class classmates Chow Yun Fat and Johnnie To Kei Fung were as close as brothers. Thus when they heard the news their mood was particularly heavy and was unable to recover at once. Having known Lam Lan Tung for over 40 years, Simon Yam Tat Wa after days of working on a film rested for a few hours in the afternoon. He never expected to receive the tragic news when he got up. "We always meet and have dinner when we are in Hong Kong. When such a good friend suddenly passed away, I am very upset. My heart really hurts, I really don't know how to describe it. I shed tears. Friendship like this I believe is rare in a lifetime! I just got off the phone with his wife. (How was she?) Heartbroken, but she was OK emotionally. (When did you see Director Lam last?) Two months ago I saw his in the recording studio, at the time we talked about life when we chatted. (Would you help with the funeral?) I definitely would, I would do my best." Lam Lan Tung excelled in action films. His 2014 film WILD CITY starred Louis Koo Tin Lok, Shawn Yue Man Lok and Joseph Chang. Because Director Lam was rather demanding, he asked for real blades and both Yue Man Lok and Koo Tin Lok were hurt during the shoot. He also went to work in the U.S. in 1996. His first Hollywood film was the action film MAXIMUM RISK, which starred Jean-Claude Van Damme. They worked together again several times after, including REPLICANT and IN HELL. In addition, he said in an earlier interview that in the film world he was god, able to control everything; but in real life he was unable to control life and death. He posted, "I would like to extend my condolences to his family, friends and loved ones." Director Dante Lam Chiu Yin said, "Why was it so sudden? He was my idol. The final school massacre scene in THE STOOL PIGEON was my salute to his SCHOOL ON FIRE. At the time I told (Nick) Cheung Ka Fai that I really like Lam Lan Tung. Ka Fai helped me arrange a meeting with him. I always tell people, I want to work with him. Now I really won't get a chance to, which is very regrettable." 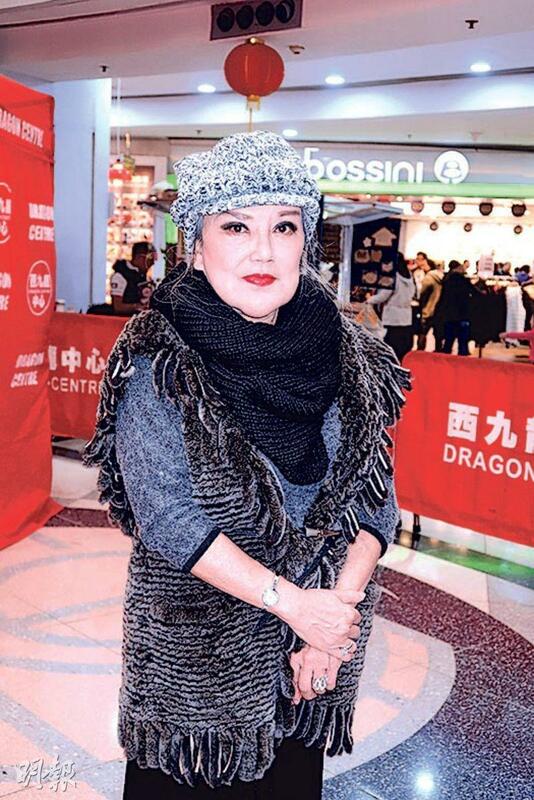 Yue Man Lok posted a black and white photo of Lam Lan Tung on social media. "Too sudden, really it's too sudden......I don't know how to react. Director have a safe journey, I will always love you, respect you......"
The 2016 film SKY ON FIRE became Lam Lan Tung's final film. Director Lam's lead actor Daniel Wu (Ng Yin Cho) posted their photo on social media and praised him for his many classic films like CITY ON FIRE and PRISON ON FIRE. As a representative of the Hong Kong 80's and 90's New Wave he promoted Hong Kong films to international renown. "We have lost a true film master. Rest in Peace! We will carry on your will!" Louis Koo Tin Lok remembered on social media, "On the way home I got the news of director Lam Lan Tung's passing. Emotionally I didn't want this to be true, but after seeing many filmmakers' eulogies I have to accept it. I worked with Director Lam in as early as 1998, unknowingly it has already been 20 years. In recent years we also made WILD CITY and he remained very demanding on himself, a creator who would always challenge himself. He has always taught me a lot, a good colleague who was both a teacher and a friend. I would always miss him." Having worked with Lam Lan Tung on HOUSE OF THE DAMNED (SI HEI BIK YUN) and LOOKING FOR MISTER PERFECT (KEI FUNG DIK SAU), Chapman To Man Chak was heartbroken and remembered him online. He said that Lam Lan Tung deeply influenced his journey as a director. "I would always remember what you said to me on the set, how to be able to make a movie good." Wayne Lai Yiu Cheung said, "I have quite an impression of him because over a decade ago I worked on his VICTIM (MUK LO HUNG GUONG), at the time we were all kids. We didn't get to go out and make movies too often. He taught me a lot, back then he appreciated and encouraged me. Over a year ago he asked me to work on SKY ON FIRE. Although it wasn't any major role, he remembered me to ask me to guest star. To me it was a huge encouragement." Wong Jing months ago had dinner with Lam Lan Tung. At the time he looked fine and very healthy. Wong Jing said, "No way, I would die before he would. However life is unexpected after 60. He and I are too familiar, I didn't believe the news when I heard it. I am very saddened!" Lam Lan Tung and To Kei Fung were both once Wong Tin Lam's disciples. Two nights ago Wong Tin Lam's Wong Jing posted on social media. "Ah Tung's passing was too sudden, my heartbreak couldn't come fast enough as only wave after wave of memories flooded in. He was Father's second disciple. When we met we were 20, but my impression of him felt much older -- like a big brother. Later I realized that he just matured early. I wrote the first show after he was promoted to head writer. Later because he rose to fame with the ON FIRE series he went to Hollywood. When he came back we even properly worked together on FULL ALERT. Have a safe journey, we will catch up again." Alan Tam Wing Lun starred in Lam Lan Tung's film directing debut ESPRIT D'AMOUR (YUM YEUNG CHOR) in 1983, later they worked together on THE OTHER SIDE OF GENTLEMAN (GWUN JI HO KAU). "What Ah Tung wanted was different from other directors. He was more explosive, his requests more alternative, more special. Even for an ordinary shot, he wanted to force and force you into another level in order to meet his demand. He was a rather demanding director. I worked with him on several films, and felt that he wasn't a simple director. He had his own style." "I heard that he was planning a movie. At our last dinner, a group of us Old Mak (Karl Maka), (Dean) Shek Tin, (Raymond) Wong Pak Ming, Cheung Ngai Ga (Sylvia Chang), Shi Nansun all came. We would occasionally get together for dinner, they would more so. The last time I saw him he was fine, he was in great spirits so it was very regrettable. It is a loss to the film industry." Lam Lan Tung discovered Maria Cordero at a night spot and asked her to perform the theme song of CITY ON FIRE and PRISON ON FIRE, making her an overnight success and changed her destiny. She responded, "I still can't accept it. Without him I wouldn't be here today. Each time I saw him I would call him benefactor. I would always run into him Sabah. He told me that he was always planting vegetable and was very healthy. The last time I ran into him in Tsim Sha Tsui, I loudly called out 'Benefactor' and he called me crazy again! When I heard the news, I couldn't accept it right away. He truly was talented and a nice guy there couldn't be more of, my condolences to his family!" Director Lam Lan Tung excelled in action films, among them the ON FIRE trilogy CITY ON FIRE, PRISON ON FIRE and SCHOOL ON FIRE were the best known. In 1987 with CITY he won the Hong Kong Film Award Best Director, lead actor Chow Yun Fat also won Best Actor. In 1997, Lam Lan Tung made FULL ALERT (GO DOH GAI BEI) and brought his career to new heights. In 2007 he worked with directors Tsui Hark and Johnnie To Kei Fung on TRIANGLE (TEET SAM GOK). In 2014 he directed WILD CITY with Koo Tin Lok, Yue Man Lok, Joseph Chang and Tong Liya. Yue Man Lok revealed that Lam Lan Tung for realism almost permitted actors to fight with real blades, which stunned Yue Man Lok! In addition, the prop currency that was used for WILD CITY due to its high level of realism led to charges for prop team member Law Yun Lam and prop master Cheung Wai Chuen. Luckily the verdict were overturned. His 2016 film SKY ON FIRE became his final work. Lam Lan Tung's family originated from Chaozhou, Guangdong. In 1973 after graduating from Saint Peter Secondary School he joined the TVB third artist training class and was a classmate of Chow Yun Fat and Ng Man Tat. In 1974 he was a production assistant, in 1976 he was promoted to head writer. In 1978 he joined CTV and made the film GUP SIN FUNG. Later he emigrated to Canada and studied film at York University. years ago he made countless films, including TWIN DRAGONS, BURNING PARADISE, THE ADVENTURERS, FULL ALERT and THE SUSPECT (GIK DOH CHUNG FAN). This year's second Hong Kong music report card the Metro Radio Hit Awards 2018 took place last night at the Convention Center. The entire event presented 59 awards to singers, less than 61 last year. Hins Cheung King Hin won 3 major awards, Hit Singer of the Year, Hit Record, and Hit Airplay Index Song to become the big winner. Jason Chan Pak Yu, Pakho Chau, Alfred Hui Ting Hung, James Ng Yip Kwan followed with two awards each. As for female singers, Kay Tse On Kay had two and a half awards, Hit Performance, Hit female Singer and the Hit Duet with Louis Koo Tin Lok. Gin Lee Hung Ngai and G.E.M. (Tang Chi Kei) also received won two awards. This year's Hit theme slogan was "music transforms life". Aside from honoring singers for producing exciting and outstanding music, the event also hoped that they through the power of music and song enjoy the joy that music itself brought to the audience, for music fans to play good songs and spread positive energy. After the award show began, guest performer William So Wing Hong performed many classic Cantonese songs and Mandarin songs. Attending singers stood to show their support and warm up the entire evening's atmosphere. 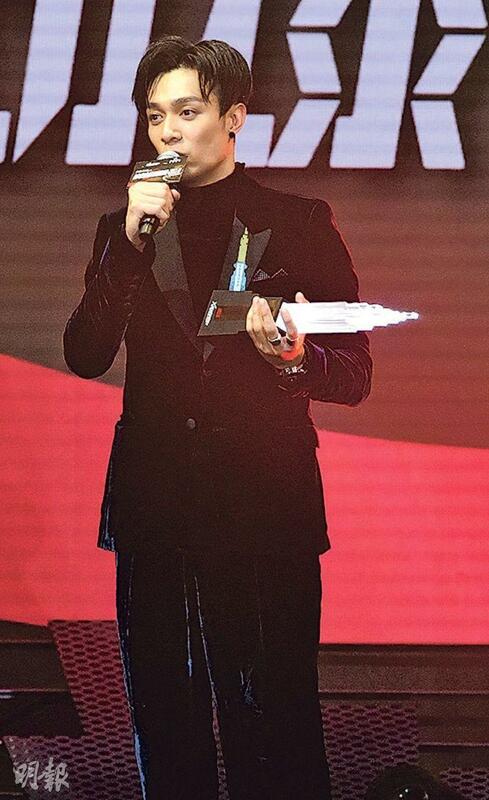 Pakho Chau struck first with PEACE FOR YOUNG AND OLD as it won the first "Hit Song" award. He said that this song expressed all that he wanted to say inside. As he grew older his wants became simpler, the most important was happiness, joy and health. He wished everyone Happy New Year and Peace for Young and Old. 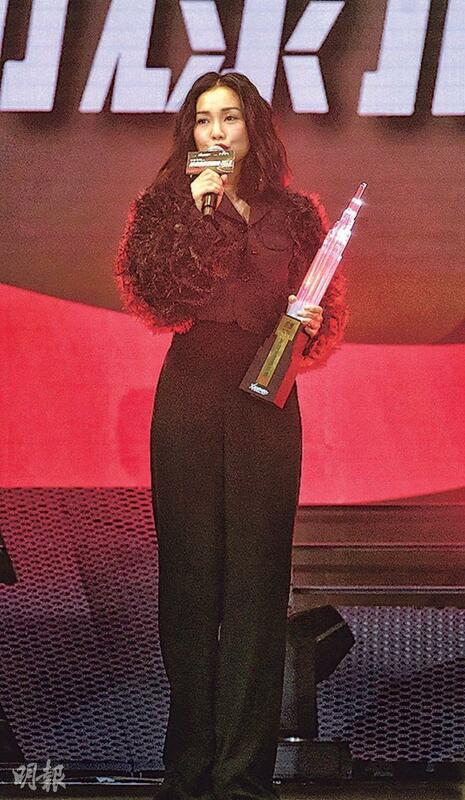 The second song award went to Eman Lam's LOVE IS A TYPE OF FRENCH DESSERT. She said that the music production process was a relay race, she only was the first leg representative of team in accepting the award. She also said that the song was very important to her, as she would put her heart into singing it for everyone at anywhere. The third song went to Vincy Chan (Wing Yi)'s PIGGYBACK. She said that this year she only released one song, but the song was very meaningful to her because it was songwriter Bert's personal experience. The second guest performer MC Jin appeared as he freestyled a part of a hip hop song. He remembered coming to Hong Kong ten years ago and at the time he also performed hip hop, but as soon as the music began the audience headed for the bathroom. He knew hip hop's development in Hong Kong would be a very difficult challenge, but for ten years he always enjoyed the process. The event later presented a "Excellent Hip Hop Performance Award" to MC Jin. He also revealed the new singer awards to Tsang Lok Tung, Kaho Hung and Joey Thye (Dai Cho Yee). This year's "Hit Male Singers" were Chan Pak Ho, Pakho Chau and Hui Ting Hung, "Hit Female Singers" were Tse On Kay, Gin Lee and Joyce Cheng Yun Yi. Past award show frequent flyers Eason Chan Yik Shun, Joey Yung Cho Yee, Miriam Yeung Chin Wa and Hacken Lee Hak Kun all went home empty handed perhaps due to their absence. 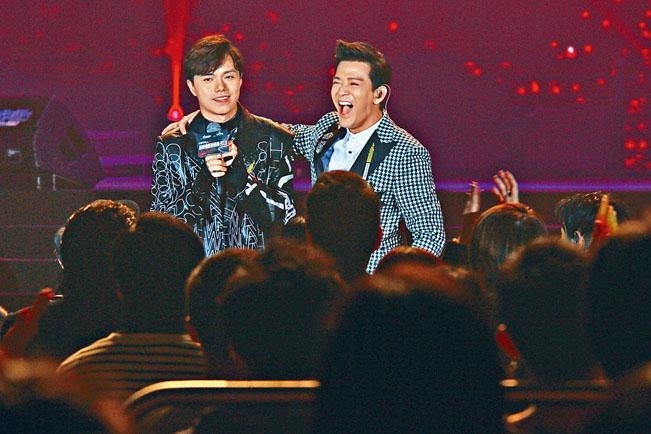 Hins Cheung King Hin also won the "Hit Singer of the Year", with the "Hit Record" and "Hit Airplay Index Song" Hin Jai won three awards to become the big winner of the night. As for Mandarin songs, Tang Chi Kei with COUNTDOWN won the "Mandarin Power song" and also retained her crown as the "Hit Mandarin Power Singer". 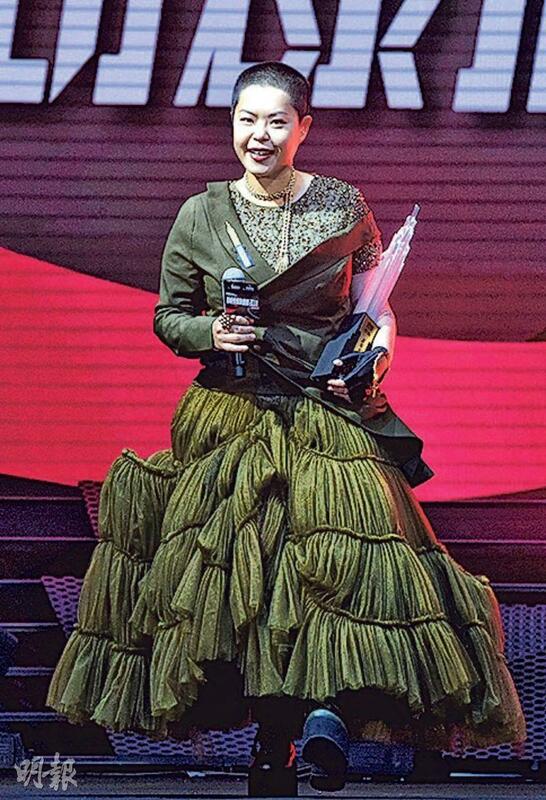 The event also presented a special "Hit Performance Colorful 60 Award" to Nancy Sit Ka Yin to celebrate her 60th year in the business. Kenny Bee (Chung Chun To) also received the "Hit Best Singer" award. With countless awards in film, Louis Koo Tin Lok this year with Kay Tse On Kay won his first Hit Duet award for (A MAN) A WOMAN AND THE BATHROOM. 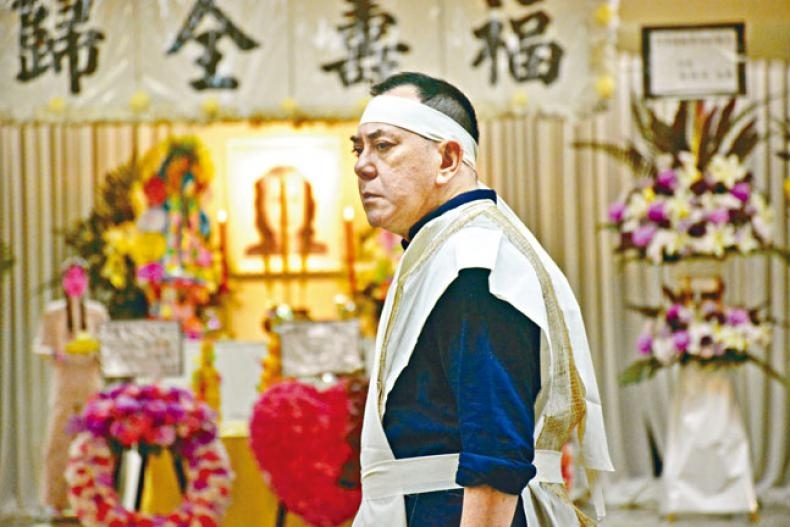 Anthony Wong Chau Sun's mother Wong Chuen Yee passed away from illness earlier at the age of 87. 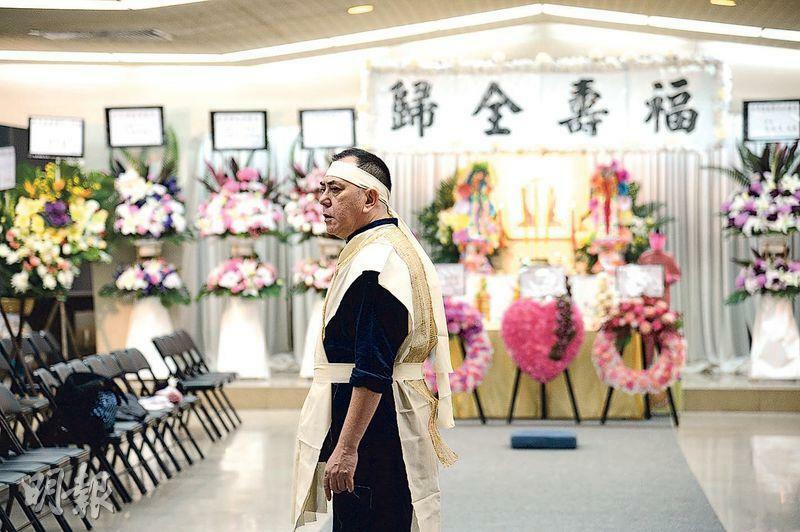 Yesterday services were held at the Hong Kong Funeral Parlor and the funeral will take place today. The burial will take place a the Cape Collinson cemetery. Dressed in black, Wong Chau Sun arrived a 3:50PM. His wife and younger son followed later. The hall was decorated in a simple and clean manner. Under Mama Wong's photo was Chau Sun and his wife's pink heart floral arrangement and floral arrangements from grandsons. Chau Sun did not want to trouble his friends so he did not notify anyone. Yet many industry insiders still sent floral arrangements. They included Andy Lau Tak Wa, Sean Lau Ching Wan, Edison Chen Koon Hei, Hins Cheung King Hin, Mo Chun Fai, Alex Fong Chung Shun and Herman Yau Lai To. Chau Sun took the chance to thank them for their thoughtfulness. The ceremony was Taoist. Chau Sun said, "I didn't want it to be too quiet and upset myself, friends and family, so I found something to make some noise." Chau Sun said that his younger son did not deliberately return from Canada for the funeral. Before Grandma passed away he already decided to return to Hong Kong for Christmas. Chau Sun said, "I have been busy with taking care of everything, I haven't had the time to settle down. The viewing was very hard though. (Did a lot of memories come back?) Of course. (What about grave goods?) I packed some clothes. Mama loved red and green. Originally she had a headband, but her head shrank and it didn't fit. I wanted to make it smaller but it broke. Maybe she didn't like to wear headbands." He revealed his half brother in Australia yesterday also sent his condolences over text. Don Li Yat Long yesterday appeared on a Commercial Radio program. He earlier wrote, directed and starred in the film SAR, which won the 2nd Chinese Korean International Film Festival new director award. Don humbly said, "I never thought about winning an award, I can only say that the Koreans like this type of subject. After the award I was excited for a week, then very quickly I returned to reality and continued to work." After the award Don was approached to direct a novel adaptation by a Korean company. Don said, "I read 12 novels in a month and chose one of them. We are in the negotiation stages right now. (Did you get a raise?) Definitely not, it can be adjusted and would anyone approach me then? For now I haven't had any actual reward, but I am happy about the award. The price is secondary, the most important is being able to make a movie I like." Currently he was working on post production for a kung fu film he directed. Earlier Don's female partner swindled HK$ 2.3 million from him. He revealed that the police was investigating. Everyday he has been waiting for good news. Did he have any financial problem? He said, "Luckily friends helped me and found jobs for me, earlier I was half retired, now my workload increased. I have no problem."